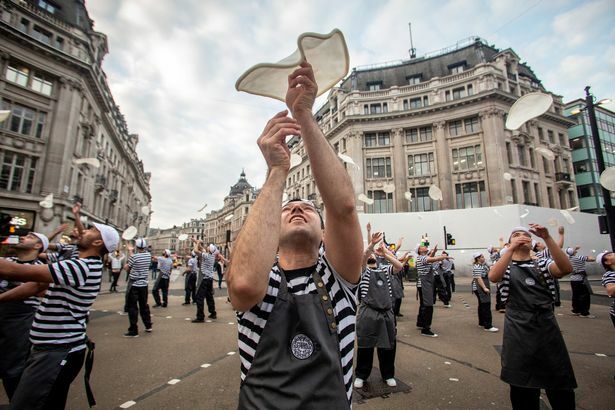 Over 50 pizza chefs from across the UK brought Oxford Street traffic to a standstill yesterday as they showed off their unique skills with a synchronised dough tossing performance. 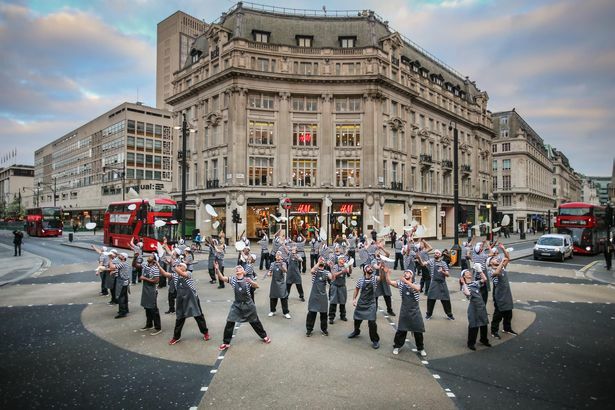 The stunt was staged by PizzaExpress to mark two landmarks for the famous pizza chain – 54 years since its first restaurant opened in London’s Wardour Street, and the opening of its new Langham Place, Oxford Circus pizzeria. Zoe Bowley, managing director at PizzaExpress, said: “Our pioneering founder Peter Boizot introduced pizza to the UK in Wardour Street in 1965. Peter leaves behind a wonderful legacy, which sees friends, families and loved ones enjoying pizza and good times together in our sociable pizzerias, every day, across the globe.